Much acclaimed as the world’s largest automated driver-less train system, the Dubai Metro has left no leaf un-turned in transforming the journey of its passengers into an incredible experience. In an endeavor to make Dubai the smartest and happiest city on Earth, the intelligent system has introduced latest technology and great features along with Nol cards, smart malls, WiFi connectivity and ATMs. Today, it has not only prioritized cost-effectiveness but also provided convenient means of travel, easy accessibility for disabled passengers, along with excellent connectivity to other public transport such taxis and buses,which made it one of the most popular, convenient and cheap modes of transportation in Dubai. It carries about 1.2 million passengers on an average day, and 355 million passengers a year. Designed to meet the highest environmental sustainability standards, it considerably contributes to the green environment by reducing carbon dioxide (CO2) emissions. The Red Line, which runs from Rashidiya to UAE Exchange has 29 stations in between them. While construction of the line started in August 2005, it was opened for public on 9thSeptember 2009. The Red Line is 52.1km with 5km underground. The entire journey time on the Red Line is around 69 to 70 minutes, travelling at an average speed of 47 kilometres per hour. The Red Line has a main depot in Al Rashidiya and one auxiliary depot at Jebel Ali Free Zone. The Green line has 20 stations and spans from Etisalat to Dubai Creek. Initiated in July 2006 and opened on 9th September 2011, it covers 22.5 kilometres with 8 kilometres underground. With an average speed of 38 kilometres per hour, the entire journey time on the Green Line is around 40 minutes. Both lines meet at two interchange stations which are Union Station and BurJuman Station. Purple Line – It will cover 8 stations from Dubai International Airport to Al Maktoum International Airport. Pink Line – It will run east to west with a terminus at Al Sufouh. Blue Line – It will cover 18 stations along Mohammed Bin Zayed Road. 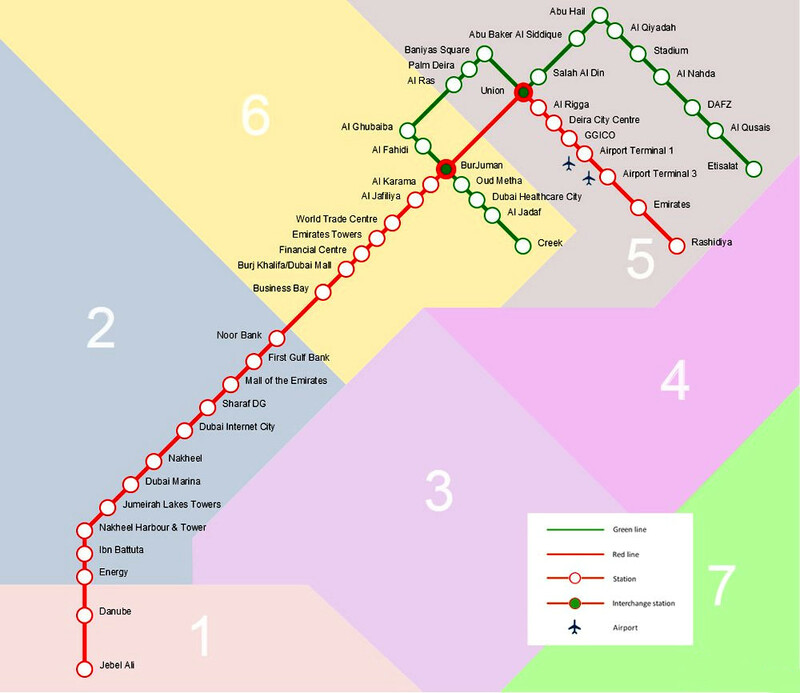 Yellow or Gold Line – It will connect Arabian Raches, Deira and Dubai Marina. Route 2020 – A 15 km. extension with 7 new stations comprising 2 underground stations starts from Nakheel Harbour and Tower (Dubai Metro) to the expo 2020 site is under construction. 2 suitcases are permitted per passenger. All luggages must be stowed in the dedicated luggage area, which can be found in each cabin. Pets are not allowed in the stations and trains. Smoking is forbidden in the Metro facilities. Eating and drinking on boarding a train is a byelaw offence. Elderly, injured, special needs people and pregnant women have the choice of priority seating. Fines are imposed for travelling in wrong cabins. Parking vehicles in areas designated for metro users for a period exceeding the permitted period. Spitting, littering, or performing any act that would compromise the cleanness of Public Transport and Public Transport Facilities and Services. Opening the doors or attempting to access or leave train while it is moving between stations and stops. Dubai Metro, the first urban metro rail network to run in the Gulf’s Arab states was inaugurated by Mohammed bin Rashid Al Maktoum, the Ruler of Dubai on 9th September 2009. The first section known as Red Line, covering first 10 stations was incepted and opened to public on that day. The Green Line was opened on 9th September 2011. Today, the metro system has eased the daily commute for thousands of workers in the emirate. The Red and Green Line was built by Dubai Rapid Link (DURL) Consortium that comprises Japanese companies including Mitsubishi Heavy Industries, Mitsubishi Corporation, Obayashi Corporation, Kajima Corporation and the Turkish company Yapi Merkezi. What’s special about Dubai Metro? The fully automated signalling and communication system is supplied by Thales Rail Signalling Solutions. With the control centre integrated at Al-Rashidiya depot, the automatic train control system allows headways of between 90 seconds and two minutes. While the communications system includes in-cab signalling, on-train video surveillance, passenger information, public addresses display in English and Arabic, LED systems and Wi-Fi, emergency call boxes are fixed in the trains for safety measures. For women and children, there is a special 12 seat car consisting of 3 flip up chairs and with more space to allow strollers and bags. Gold class cabin is equipped with 18 deluxe seats located at the front of the train. This VIP cabin is more spacious with a higher level of privacy, luggage space and leather seating. Silver or Standard class has standard seating arrangement for 25 to 27 seats in a combination of blues and greens. There are special facilities for the physically disabled. Station staff is trained as first aiders and there are first aid rooms in stations. The Wojhati App launched by RTA in 2013, allows users to view routes, major landmarks, stops and departures, and helps plan journeys using metro routes. While upgrading its mobile services, the RTA has also introduced 5 Smartphone applications that included Public Transport app. To bring in an integrated automated fare collection card, the RTA introduced the Nol card. It is an electronic ticketing card that holds prepaid funds to pay for fares on trains. Passengers swipe on and swipe off their cards on electronic gates when entering and leaving the metro to validate it or deduct funds. These prepaid cards can be topped-up online, at ticket machines or at ticketing offices by cash, credit and debit cards. Designed to reduce the number of transactions at ticket counters and the number of paper tickets, the Nol card offers cheaper fares than the paper ticket option even though you have to purchase it. Dubai Metro offers free multi-level car parking with an estimated capacity to accommodate more than 8,000 vehicles. Fines are imposed for leaving vehicles overnight. The smart mall concept at Dubai Metro was rolled out by RTA in alliance with Etisalat. The first of its kind globally, the smart malls offer commuters a unique shopping experience via an interactive, high-definition 3D digital screen that spans over 9 sq metres. Customers can pick from the items on show by adding them to the shopping cart and paying by credit cards. All goods are delivered at the time and place specified by the customers. Islamic Art and Arabic Calligraphy Museum displays historical manuscripts, ceramics, jewellery, calligraphy paintings from 1400 years of Islamic history. Inventions Museum offers interactive and educational displays of inventions from various fields like astronomy, engineering, geography, mathematics and medicine. Contemporary Art Museum is a collection of modern art from contemporary artists including paintings, designs, graphic illustrations, and models. Visual Art Museum displays contemporary visual art including movies, documentaries, cultural and artistic multimedia creations. The Dubai Tram integrated with Dubai Metro at the Dubai Marina and Jumeirah Lake Towers stations in 2014. Footbridges are now connected creating a direct link between the two adjacent tram and metro stations for a smooth and seamless interchange for passengers between the two systems.